It is with great sadness this morning that I must tell you all that our Blu-ray of STREET TRASH is being delayed slightly. Just slightly. 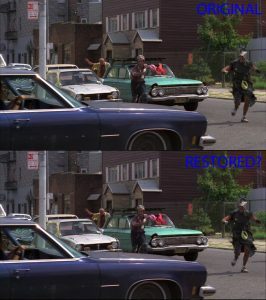 Unfortunately, our remastering of STREET TRASH has been plagued with similar restoration issues we had a little over a year ago with THOU SHALT NOT KILL… EXCEPT (LINK). Before I begin, I want to apologize for this. It’s frustrating for all involved, and we at Synapse feel absolutely awful about it but, for me personally, this project is currently in a state that I refuse to release. I have discussed it with my business partner, Jerry Chandler, and we both agree that the delay, to fix the issues at hand, is more important than to release a botched product to our fans, and to the marketplace, just to meet a deadline. Now, a little history about the genesis of all this. STREET TRASH was transferred in high-definition on a Spirit Datacine from the original camera negative. As with many negative elements, there were issues with glue, splices, etc. that needed to be addressed and, since the previous release was only on DVD, the resolution of SD DVD actually “hid” a lot of the issues because of DVDs drop in resolution. You just didn’t “see” a lot of the negative’s inherent problems at lower resolution. With our new HD version, there were things I wanted to fix. Now, Synapse Films is no stranger to digital restoration. We’ve done it, with varying degrees of success, on many projects. I am willing to explore all options to get what I need to have done, and I have used quite a few companies, all over the USA, to do the work. Unfortunately, sometimes the work I’ve requested isn’t always what I receive from those in charge of the restoration. Because of my quest to actually find someone I can continually count on to do my requested work, I decided to send STREET TRASH to someone new, based upon the recommendation of someone I whole-heartedly trust and respect in this business. At this point, I must state that I am not going to be naming names. What’s done is done, and it has to be remedied. What happened with STREET TRASH isn’t exactly clear. The requirements were discussed and what I ended up getting back was not what I’d asked for. 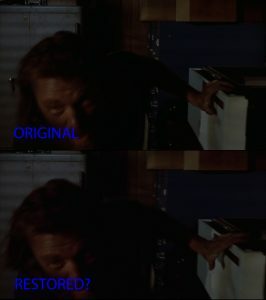 Whether it happened because of hidden/mistaken computer settings, or just because restoration artists tend to “tinker” (let’s face it… they ALL obsess over dirt/defects in film and, many times, take it upon themselves to fix things they were not asked to do). While this tinkering is welcome SOME of the time, in my experience, this may fix problems but it then creates MASSIVE new issues that were not expected. Such is the case with STREET TRASH. Now, on to the examples of what was happening. What I’m going to show you here are comparison shots. 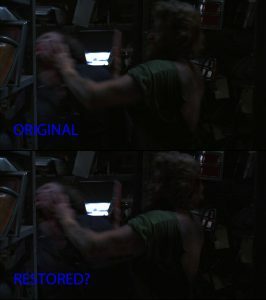 When I got our first disc of the finished restoration and was going through it, upon first look, I was quite pleased. The credits were stabilized and I was extremely happy… that is, until I started noticing things that were entirely unexpected. Here’s a good example. (Just a note that these screengrabs may be rather large, so they may take a moment to download, as well as requiring a couple of clicks to see at the larger size). Looking at this, do you see the issue? How sharp are your eyes? Before I reveal what is wrong underneath the photo, take a moment to look and see if you see what I see. Go ahead (again, click a few times to see a larger version). If you see the details vanishing from the busted striping on the side of the blue car, give yourself a pat on the back. Bonus points to those who also see there is some artifacting on the turquoise car as well. Of course, this is only one of a multitude of examples of what I was seeing, so I immediately informed both the authoring facility, and the person doing the restoration of the issues at hand. The restoration artist started fixing some of the things and said that there was a “turned on” setting within his restoration software that had some sort of “deflicker” filter turned up to the maximum. Okay, I thought… it was a mistake. Immediately trying to forget the fact that I didn’t ask for “deflicker” in the first place, I went with it and waited for him to re-render the film and get us a fixed version. He sent the new file, we recompressed and authored a new disc and I received it, praying that the problems had been resolved. They weren’t. Unfortunately, out of the list of things I noticed right away, only one or two of them were remedied by the removal of the “deflicker” issue. At this point, I couldn’t help but notice something MUCH more insidious was afoot. At this point, I was getting a bit alarmed. The street date was looming and, honestly, the restoration artist was pissed at me. He, like myself sometimes, was getting rather defensive towards his work, even pointing out to me that a couple of my concerns were “spurious.” Well, excuse me for making a list of items and having a couple of them actually just be film issues and not artifacts. Doesn’t change the other shots that were bad. Whatever. The video file he rendered was still unacceptable. So I find out that, in the interest of time and deadlines, he didn’t even bother to completely look at the new file he rendered before sending it to us. This, of course, cost us dearly. I sent him a new list of fixes and, working with my authoring company, he uploaded many, many more shot fixes. At this point he was incommunicado with me, which was fine. I have to trust people to fix their work and get things done as I was working on other upcoming projects. I got another disc and, while a lot of things were fixed, there were still some areas that needed to be addressed so I just took it upon myself to spend another week going through the film, basically frame by frame and finding more issues. My authoring guy, who is also an editor, was a very good sport about all this. Just like me, he’s very critical of certain restoration systems and their capabilities, so he had the drive and desire to help Synapse Films out to get it right. Unfortunately, even our efforts weren’t enough. See the handles on the file cabinet? The two things above are all things that go by SO fast, during motion, that most normal viewers won’t even notice. I see this kind of thing more and more on a lot of films released to Blu/DVD these days. Thankfully, I did see them throughout our program’s running time before going to press. This isn’t just a couple errant frames, but it happens throughout. Synapse Films had to make a judgement call. Our judgement call is this. We’ll fix a few things manually on our own and keep the majority of STREET TRASH untouched. I would rather release a product with a few actual film related anomalies like a few instances of dirt, etc. here and there, NOT an entire transfer completely botched from beginning to end by messed-up digital restoration. It’s NOT better. It’s worse. Synapse cannot release this to the fans in its current state. 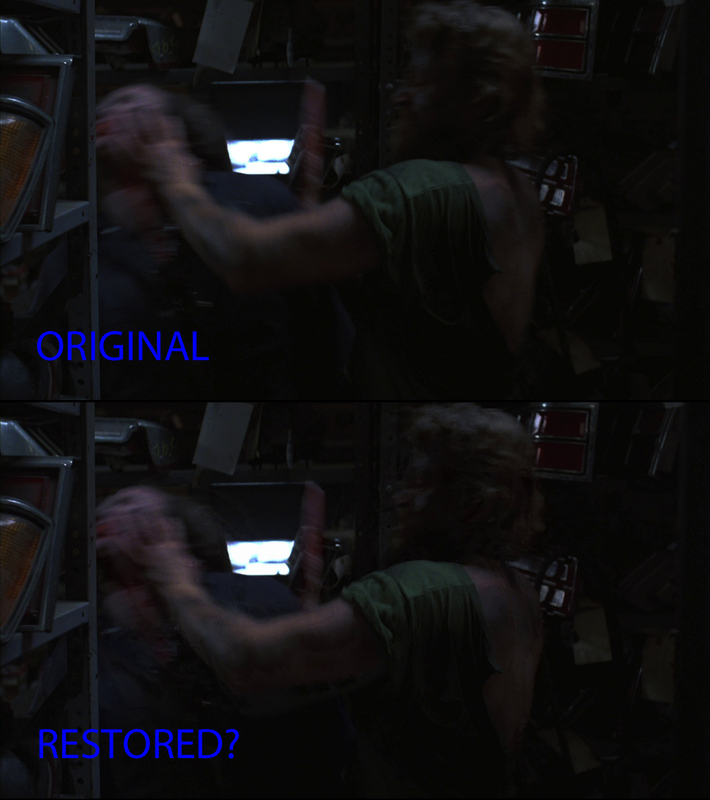 Last week, I emailed the restoration artist a message that said we were going to have to revert back to the original scan that was originally approved and supervised by producer/writer Roy Frumkes and just go with it, instead of the work he’d performed. I received one final message from him saying that my decision was for the best and that (paraphrasing here) “like so many other vendors, I do not meet your quality standards.” Hmm… well, I’m not entirely sure this was some sort of final zinger/insult thrown at me or not, but I actually consider words like this a compliment to my dedication to creating the best product I can possibly do, within my means. I wouldn’t have it any other way and I’m sure the fans of Synapse Films appreciate that, too. Fixing splice bumps at the beginning and end and doing some manual dirt cleanup, turned into noise-reduction, grain reduction, deflicker and artifacting that was so unexpected, that I’ve been dealing with fixing the issues now for well over a month. Today, Monday May 6th, the issues are not 100% remedied and I’ll not be able to get the finished Blu-ray master to the replicator until next week, at the earliest. I doubt the replicator will get the product finished by (and we won’t be able to ship to our distributors by) the beginning of June to meet the street date of the 11th. I’ll hopefully have some more news on the street date adjustment soon. I personally don’t think it’ll be more than a couple weeks later than planned but my distributor may just want to move it to the next assigned street date of July 9th. As always, Synapse Films would like to thank you all for your continued support and understanding. STREET TRASH is important to us and we do not want to disappoint the fans by releasing something that, we personally feel, is not good quality.